This package will really make you stand out from the crowd. As a personal trainer working in a gym, clients are looking for the most qualified, so when they see the board of all the personal trainers to choose from they will go with the most qualified. Build up your reputation and your skillset and add these additional skills to your portfiolio. The courses in this package are the basic principles of becoming a personal trainer and are the industry standard qualifications that every fitness employer is looking for on a CV. You will start with the Level 2 Certificate in Fitness Instructing and cover subjects such as anatomy and physiology, principles of exercise, fitness and health and how to design and instruct gym based exercises. Once you have passed the Level 2 part of the course you will gain certification as Fitness Instructor and gain employment in the fitness industry while working towards your Level 3. Once you have completed the Level 2 section, you with then start the Level 3 Certificate in Personal Training. This will upgrade your status from Fitness Instructor to Personal Trainer and dramatically increase your income with many personal trainers now demanding in excess of £45 per hour for their services. As a personal trainer you will be qualified to set up your own business or work as a freelance in one of the large gym chains such as Virgin, David Lloyds or any other gym organisation where successful personal trainers are earning well over £80 per hour in the centre of London. We have literally thousands of students studying for this qualification and there is now hundreds of qualified FitLearn Personal Trainers now working in the fitness industry pursing their passion. Our students come from various backgrounds such as university students looking to increase their income while studying to doctors looking to increase their knowledge to pass on to their patients. Literally anyone can enrol on to this course, you do not need any previous experience or knowledge. All we ask is that you have a true passion for fitness and a desire to change people's lives through exercise. Studying for a personal trainer course no longer has to be expensive or complicated. With just a £19.99 deposit you can start your studies immediately. 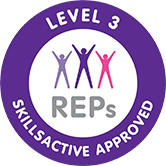 All of our personal training courses are REPs and CIMSPA endorsed which means our qualifications are identical to all other training providers! No matter who you study with, training providers deliver the identical information, courses and units as set by OFQUAL. The key difference between training providers is how we deliver and assess plus the support provided. FitLearn offers 24/7 support to all of our students! We believe that FitLearn is the easiest way to being qualified with online exams and no travelling for your practical exams. WHY PAY THOUSANDS FOR A PERSONAL TRAINING COURSE? How we learn is changing, technology is making it easier than ever to train and become what we want. With FitLearn's new study platform studying is made easy while working around a family or other commitments. You no longer need to get a loan or enrol to expensive courses to become a personal trainer. Gone have the days where you have to travel the length of the country to sit in a classroom, we bring the classroom to you. We remove the barriers to studying and make our courses as affordable as possible. Sit back and relax as you’ll access all your course through our online student portal, where you will be presented everything you need to know in simple easy to follow webinars presented by your tutor. As everything is online, you can study anywhere with an internet connection, at any time of day, whether it’s on a laptop, phone or tablet. There are no timetables or deadlines apart from the end of the generous support period, so how quickly or slowly you work is all up to you! Access your course through the student portal and watch your tutor present the lessons. Studying online doesn’t mean you are left in the dark. From enrolment to graduation, you’ll have unlimited support from your dedicated fitness tutor online or by phone. All our tutors are health and fitness experts with years of experience in the industry. You’ll also have our student support team waiting to help you with non-academic questions. We use specialist e-exam software to ensure your exams are as safe, reliable and secure as if you sat them in an exam hall with an invigilator peering over your shoulder. You can sit it whenever you’re ready to, whether its on a plane train or bus! Choose to fast-track and you could get qualified in just 8 weeks. FILM YOUR PRACTICAL ON ANY DEVICE. With us, there’s no inconvenient travelling to distant assessment centres. You can do your practical assessments at your local gym! All you need to do is grab a gym buddy and your smartphone and record yourself demonstrating a session. We will give you access to your own Dropbox folder so you can upload them to your portfolio and send them to your tutor directly from your phone. Your tutor will give you detailed feedback so you know where your strengths are and where you can improve, and you can always do it again if you don’t get it quite right! Film your practical at your local gym directly from your phone when you feel ready. THANKS! CLICK HERE TO DOWNLOAD THE 2019 PROSPECTUS! Can I register with REPs or CIMSPA? Absolutely! You can register with REPs at Level 3 and also join CIMSPA once qualified. Can I fast-track my course? Absolutely, you will be offered the option to fast-track your studies on the checkout pages. Is their any additional fees? All awarding bodies charge registration and certification fees. At present the Level 2 Certificate in Fitness Instructing is £80 and the Level 3 Certificate in Personal Training is £90. Once your assessments are submitted they will be marked by your tutor. Once passed we will apply for your certifcates to be issued. Awarding bodies say to allow 6 weeks for the delivery of these but in our experience they usually take no more than 2 weeks. Please note that if paying by monthly installments, we will require the balance of your account to be settled before we apply for your certificates. This can be done anytime by calling the finance department.